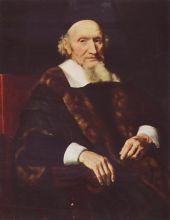 Maes was the son of Gerrit Maes, a prosperous merchant, and Ida Herman Claesdr. In about 1648 he went to Amsterdam, where he entered Rembrandt's studio. 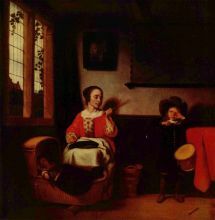 Before his return to Dordrecht in 1653 Maes painted a few Rembrandtesque genre pictures, with life-size figures and in a deep glowing scheme of colour, like the Reverie at the Rijksmuseum in Amsterdam, the Card Players at the National Gallery, and the Children with a Goat Carriage. 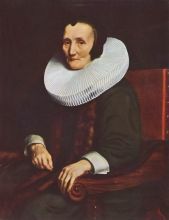 So closely did his early style resemble that of Rembrandt, that the last-named picture, and other canvases in the Leipzig and Budapest galleries and in the collection of Lord Radnor, were or are still ascribed to Rembrandt. 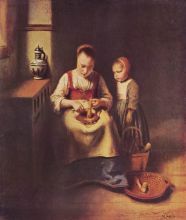 In his best period, from 1655 to 1665, Maes devoted himself to domestic genre on a smaller scale, retaining to a great extent the magic of colour he had learnt from Rembrandt. 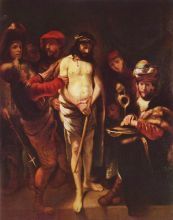 Only on rare occasions did he treat scriptural subjects, as in Hagar's Departure, which has been ascribed to Rembrandt. 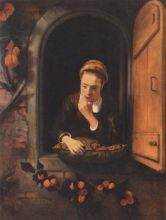 His favorite subjects were women spinning, or reading the Bible, or preparing a meal. 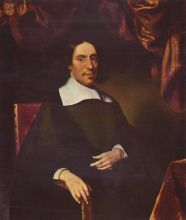 While he continued to reside in Dordrecht until 1673, when he settled in Amsterdam, he visited or even lived in Antwerp between 1665 and 1667. His Antwerp period coincides with a complete change in style and subject. He devoted himself almost exclusively to portraiture, and abandoned the intimacy and glowing color harmonies of his earlier work for a careless elegance which suggests the influence of Van Dyck. So great indeed was the change, that it gave rise to the theory of the existence of another Maes, of Brussels.